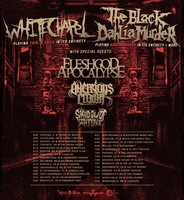 This June/July, The Black Dahlia Murder and Whitechapel will embark on a co-headlining USA tour, featuring Fleshgod Apocalypse, Aversions Crown, and Shadow Of Intent as support. The Black Dahlia Murder will be performing their new album, Nightbringers, front to back and more on this trek, while Whitechapel will be playing their classic This Is Exile in its entirety, to celebrate the record's 10-year anniversary - making this one show not to be missed! The Black Dahlia Murder comments: "We've known Whitechapel since their humble beginnings and seen them rise to be the important force in heavy music that they are now. It's exciting to team up with them for this co-headlining tour that's sure to decimate venues everywhere this summer! See ya soon!" 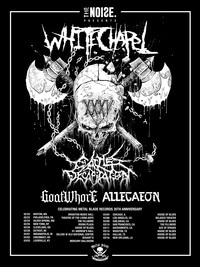 Whitechapel adds: "We are excited to be doing a co-headliner with our friends and label mates The Black Dahlia Murder. To celebrate the 10-year anniversary of 'This Is Exile', we will be playing it as a whole, and Black Dahlia will be playing their new record as a whole as well. It should be a great night of metal, including the opening acts as well." Join us for our first tour of 2017 in celebrating the 35th anniversary of Metal Blade Records. 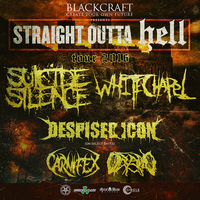 Metal Blade has been around for 3 and a half decades and we have been there for 8 of those years so we are proud to headline this tour for them.